To complete a task of unblocking a storm water culvert for NSW Government on the shores of Lavender Bay, Sydney Harbour. Chatoyer Environmental was contracted by Polaris Marine to manufacture suitable environmental protection measures in the case of an oil spill or migration of sediment during the operation. The storm water entry is nearby a train terminal and the type of blockage was unknown including what would be released when the blockage was dislodged. Polaris Marine and Chatoyer Environmental have enjoyed a successful supply relationship for over 4 years and have together installed over 2,000m of Silt Curtain into Sydney Harbour and Parramatta River. 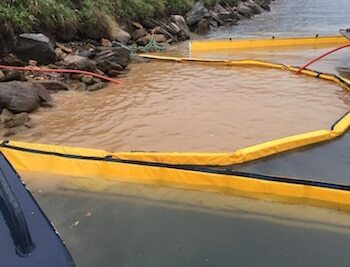 With respect to this waste removal exercise, a primary containment area was created using a tailored Silt Curtain to prevent any discharged debris from entering the harbour from the outfall. During the exercise, a great deal of mud was generated from the high pressure cleaning techniques and the curtain performed very well in containing this sediment. A secondary containment measure was put in place via a Floating Fence Boom which ran around the perimeter of the exercise including the work barge. As this boom is impermeable it formed a continuous containment bund in the event of an oil or hydrocarbon discharge, however it acted as an additional barrier for any surface debris that the primary boom could not maintain.